Thirty-five-year-old Sarah Golden died this date, April 30th, in 1853 and was buried at Bethel Burying Ground. Thirty-five-year-old Sarah Golden died this date, April 30th, in 1853 of Tuberculosis and was buried at Bethel Burying Ground. She worked as a laundress earning $50 a year, according to the 1847 Philadelphia African American Census. Fifty dollars in the year 1847 is equivalent in purchasing power to $1,506.80 in 2018. Ms. Golden was married to Samuel Golden who was employed as a waiter and, at one point, worked part-time in a stove store. The death of Ms. Golden left three children motherless – Joseph (16 y/o), Emeline (8) and Isabella (5), according to the 1850 Federal Census. The family moved a good deal. They lived in Atkinson Court, Smith’s Court and Hurst Street – all locations where the residents lived in extreme poverty and perfect environments for Tuberculosis to spread. The entire family likely would have lived in a 9’x9′ room for which they paid approximately $5 a month. An elderly Black man dying of Consumption (Tuberculosis ) living in the cellar of a tenement. “Neglected Neighborhoods,” p. 279. Chas. F. Weeler is the author. 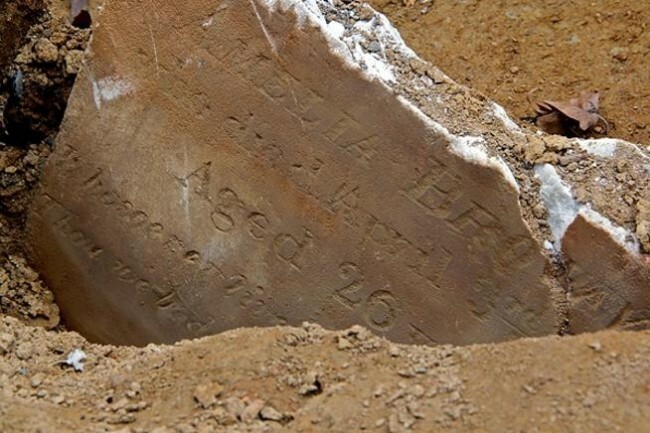 One-year-old Lafillia Harrison died this day, April 28th, in 1840 and was buried at Bethel Burying Ground. One-year-old Lafillia Harrison died this date, April 28th, in 1840 of Convulsions and was buried at Bethel Burying Ground. Her parents, James and Lafillia Harrison, lived on Carpenter Street between 8th and 9th Streets in South Philadelphia. The 1847 Philadelphia African American Census reports Ms. Harrison’s occupation as “nurse” and Mr. Harrison as “in service,” most likely as a butler or a coach driver. There also is another female in the household who is reported to be between 15 and 50 years of age and employed as a seamstress. The Harrisons’ Carpenter Street address is currently only a block away from what is now known as the “Italian Market.” The name for the market was coined in the early 1970s for an area of south Philadelphia featuring numerous grocery shops, cafes, restaurants, bakeries, cheese shops, and butcher shops. In 1840, the Harrisons would have shopped for food and dry goods at the Eleventh Street Market at 11th Street and Moyamensing Avenue, about a mile away to the west. The other close market would have been at 2nd and Pine Street, again about a mile away. The Harrisons would not have been able to use public transportation to go to the markets because of the color of their skin. Above are two views of the South Street Market where the Harrisons may have frequented. The Moyamensing Market would have been very similar. Ten-year-old Samuel Irvine died this date, April 23rd, in 1835 and was buried at Bethel Burying Ground. Ten-year-old Samuel Irvine died this date, April 23rd, in 1835 of Marasmus and was buried at Bethel Burying Ground. An archaic term, ‘Marasmus’ stood for a variety of malnutrition, wasting and starvation illnesses. The condition has been characterized as a disease of the “extremely poor.” Often the infant or child was getting too many carbohydrates (cheaper) and little if any protein (more expensive). The identity of young Samuel’s parents is a mystery at present. They do not appear in any city directories nor in local or federal censuses of the era. The family did lose another child, eighteen-month-old Sophia, due to Hydrocephalus, on July 6, 1841. The Irvines lived in Shield’s Alley at the time when both children passed away, according to their death certificates. It appears that the adults did not want their existence to be public knowledge. Perhaps one or both were escapees from enslavement. Slaves catchers roamed the cities of the North looking for liberated Black men and women. Another interesting circumstance is that the children’s death certificates were both signed by the same physician whose first language was French. There is an indication that he may have practiced medicine in Haiti at one time. This is the death certificate of Sophia Irvine who very likely was the sibling of young Samuel. They probably rest in the same grave. Dr. Joseph G. Narende signed both certificates. Shield’s Alley was a dead end backstreet, only ten feet wide, lined with two-story wood frame buildings, split down the middle by grimy cobblestones. Located at the corner of 9th and Locust Streets in center city Philadephia, the Irvine home would have been a room, maybe 12’X12′, with no running water or indoor toilet, both of which would have been available in the backyard of the building. For this, according to the 1847 Philadelphia African American Census, they would have paid from $2-$3 a month. The average weekly salary for an African American laborer was $3-$4 a week when they were able to find work. Shield’s Alley (red arrow) was later renamed Aurora Street. It no longer exists and is currently the location of a parking garage for Jefferson University Hospital. Thirty-eight-year-old William Stevens died this date, April 5th, in 1848 and was buried at Bethel Burying Ground. Thirty-eight-year-old William Stevens died this date, April 5th, in 1848 of Hectic Fever and was buried at Bethel Burying Ground. Hectic Fever was characteristic of typhoid fever or typhus, although commonly seen in bacterial endocarditis, tuberculosis, and bacterial pneumonia. Mr. Stevens, a waiter, was married to Lucy Stevens who worked as a laundress and was 38 years old at the time of her husband’s death. She was born in Delaware, according to the 1847 Philadelphia African American Census. They had three children. William was 16 in 1848 and was born in Delaware. While Emma (10) and Faisby (6) were born in Pennsylvania. Ms. Stevens was pregnant with twins when her husband’s died. The twins were named Francis and Mary, according to the 1850 Federal Census. The 1850 Census reported that Ms. Stevens was no longer working and that William, now 18 years old and working as a laborer, was supporting his family. They lived at 27 Washington Street which was between 11th and 12th Streets and Lombard and South Streets. Lucy Stevens never remarried and died at eighty years old in 1890 of heart and kidney problems. She was working as a cook, according to her death certificate. Ms. Stevens was buried at Olive Cemetery and later was reinterred in Eden Memorial Cemetery in Collingdale, Delaware County, Pennsylvania. At the time of Mr. Stevens’ death, over one-third of the Black families in Philadelphia were headed by single women.